So you’re putting together a scientific conference. You’ve chosen your topic, location and date. You’ve booked a venue and lined up sources for coffee, lunch and cocktails. You have all your podiums in a row. You’re scouring the planet for the top experts in the field, hoping that you can get enough of them in one room at one time to spark a great conversation, launch a new initiative, maybe even shift a paradigm or two. Here’s something that might help you accomplish that: invite an artist. Why should conferences invite artists? What do they bring to the table? 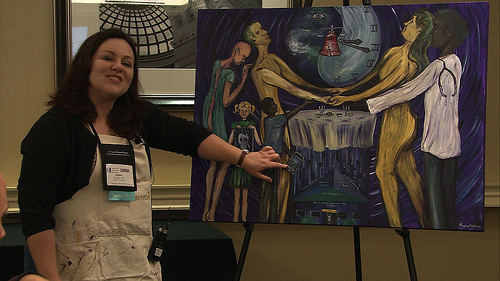 I asked Regina Holliday, who has been live-painting at health care conferences for three years. “I disrupt them,” says Holliday. “I give them a different worldview,” adding that her “very visual” take on the proceedings of large meetings can cut through the massive pileup of verbal information that most conferences provide. That outsider perspective is key, says Ben Lillie of TED, noting that “inviting people who engage with culture is crucial if a field wants to be relevant.” Some conferences have already figured this out. One of the most innovative meetings in the science field, TEDMED, an offshoot of TED that focuses on the future of health and medicine, featured not only top researchers, but a songwriter, a poet, and a dancer at its 2013 conference. Students and faculty from the Rhode Island School of Design painted portraits of all the speakers, which were used in printed materials and on-site. The AAAS (American Association for the Advancement of Science) took the theme “The Beauty and Benefits of Science” for its 2013 meeting, which featured panels such as Art as a Way of Knowing and Integrating Art and Design into STEM Education. ScienceOnline 2013, a major gathering of science communicators, featured a broad range of panels on science-related art ranging from cartooning to video to rap. But these are exceptions. Most scientific conferences follow a predictable format: presentations by researchers, panel discussions and poster sessions. Breaking the mold requires a leap of imagination. Regina Holliday was already painting murals about her own and others’ bruising experiences with the medical system, when Kevin Kruse of ePatient Connections asked her to speak at a meeting in 2010, and suggested she live-paint her interpretations of other speakers’ messages and auction off the finished paintings for charity. She hasn’t stopped since, attending dozens of meetings and conferences, including TEDMED, and generally producing a canvas a day based on the proceedings. At many such meetings, “the people on stage get to speak, but the people in the audience don’t. But I’m in the audience painting, so people talk to me,” says Holliday. She says that her role enables her to express the content of the people in the crowd as well as those on stage. Of course, not every artist can whip up a masterpiece on-site. What works for Holliday, who paints with acrylics, would clearly not be practical for an artist working in clay, glass or fiber. However, less portable types of art can easily be incorporated into conferences in other ways, via projections or video, for example. If the venue allows, large-scale art can be installed ahead of time or exhibits coordinated at nearby spaces which could then host lunches or cocktail receptions for conference-goers. Biology professor and frequent conference attendee Jonathan Eisen notes, “Art added to talks can be very powerful and allow or force people to think differently about the topic.” Instead of (or in addition to) text-based slides, presenters can show artwork relevant to their topics. For example, biologist Jack Gilbert of Argonne Labs often shows this piece that I painted based on his microbiome work when he speaks at meetings, and Eisen suggests that artwork could also be shown alongside research posters. Certainly, there are areas of science in which art is directly relevant to the research. Visual and auditory processing, for example, are fields that practically demand art and music as an integral part of presentations of the science. But artists are working on many topics that would also fit easily into conference programs. I could see Jessica Beels’ sculpted paper neurons and viruses at SfN or ASM. Rebecca Kamen’s Elemental Garden, based on the periodic table, at ACS. Laura Moriarty’s geologic strata in encaustic at AGU. And imagine Angela Mele’s gorgeous paintings of slime molds presented to a room full of mycologists. Bliss! Which brings up another point: Inviting artists to scientific conferences is not only good for scientists, it’s good for artists. Major scientific meetings like AAAS, ASM and ACS are attended by around 10,000 people every year. The mammoth SfN annual meeting brings in nearly 30,000. Meanwhile, an artist might work for years on a gallery show that only attracts a few hundred. Online exposure can expand the audience, certainly. But scientists continue to travel and pay to attend conferences in person, even when they can stream them live on their laptops for free. Why? Because the experience of being there – the conversations, the introductions, the total immersion in their chosen field – is worth the time and effort. This is true for artists too. Artists at scientific conferences can do far more than show and discuss their work. They can talk about the science that inspires them, or in some cases the science they have developed to carry out their work. Some examples might be Franziska Schenk’s work on iridescent paint chemistry or Charlotte Jarvis’ development of a bio-engineered bacterium for an art project. They can explore ways that artwork can be used to communicate science to new audiences or to evoke a sense of wonder. This entry was posted in The Art of Science and tagged AAAS meeting, ACS meeting, Charlotte Jarvis, Jessica Beels, Laura Moriarty, Regina Holliday, science art, science conference, scientific artwork, SfN meeting. Bookmark the permalink. What an interesting idea! I agree wholeheartedly that the inclusion of art (and artists) at scientific meetings would benefit all of us. A colleague and I recently received a grant to develop an art exhibition that examines artists’ representations of HIV/AIDS. Our hope – increase the dialogue between the sciences and the humanities. You should have a look at the work of glass sculptor Tim Tate, who is HIV+ and often incorporates the theme in his work. Hi David, I think your idea of inviting artists to science meetings is a good idea for a number of reasons including stimulating discussions. We would be more than happy to include art at scientific meetings. Hope to keep in touch if you need help or anyhing else. Well done for your article!! One of the things I am really looking forward to in furthering my career is attending conferences. I hope that lots of them will be conferences like this! Trust me, the number of artists in attendance at ANY scientific conference is already huge, far larger than you would ever imagine. I have never in my life understood the belief — firmly held only by career artists in my experience — that the arts and sciences are not able to be housed in the same brain. Artists do indeed tend to be scientifically illiterate (there’s no other word for it), but I have met so very many hard scientists who are painters, musicians, photographers, writers. I’m serious — the whole concept that a gathering of scientists “needs” an artist is based in a fundamentally broken assumption made by artists: that the scientists must be as incapable at art as the artists are at science. This is overwhelmingly not the case. There is no assumption. Professional scientists and professional artists tend to have different focuses based on the demands of their work. In addition to my scientific training, I am very invested in the arts. One of the reasons I like to be around professional artists is that, despited my interest and creativity, I not only lacked the time to develop my technical skills in those areas, I could not possibly develop the expert understanding of the history, variety, and theory that many professional artists can bring to a discussion. It is, frankly, hubris to think that one field of expertise cannot benefit from the perspective of another field of expertise. In my experience, artists are scientifically literate and illiterate at the same rate as the general population. To someone in a scientific field, this approximates to almost universal scientific illiteracy. In much the same way, I suspect the expert artists would be quite amused at our belief that we scientists are artistically literate. This is a great idea, congratulations for telling me about it. I wonder if they need an artist in Australia. Art IS a science. Love your piece! Inviting an artist is a great idea. Reinterpreting from that outside perspective is awesome, as noted. I think they also help to break the tension in the room as well. Human icebreakers. Keep up the work! My research is in the social sciences, but I think it would be great to have an artist at social science conferences as well as at scientific conferences. A different perspective to what’s being discussed, or on the discussion itself, can be very enlightening. Thanks for this thorough and powerful post! I’ve loved Regina Holliday’s work, and it was fascinating to learn about other artists with similar interests. It’s exciting to see that there is a growing appreciation for the place of art in science, and I look forward to learning more about how these intertwined fields develop with one another. Great idea! I think the arts and sciences should work more closely together. The arts can be very scientific and help bring the intellectual ideas to the visual plane. Thinking in different and new ways are what keeps ideas fresh and relevant to learning. Hi Artattack, thanks for introducing yourself by following our site. There’s so much to explore on yours–it’s great to see so many examples of blending art and science! Cheers! I have to say, any conference I’ve been to so far has greeted with great cynicism, any efforts to inject a fresh cultural perspective on the topic at hand. This is a great shame, and hopefully a trend that will not persist as science needs to be communicated, not just to academics, but to anyone willing to listen. Science blogs are a wonderful way of communicating with the public, as a gifted blogger knows how to frame the work in a way that appeals to their audience. Even comedy websites such as Cracked and The Oatmeal do a great job of feeding science to the readers by hiding it in jokes (A spoonful of sugar helps the medicine go down). If the written word and comedy can be used to communicate, then why not other media? This was a well argued, thought provoking post. Keep up the good work. More people are artistic than we may think. You have a wonderful blog and some great comments. What a fun conversation. Forrest McCluer and michelebanks1 – thanks for the suggestions. Our planned HIV art exhibition is an outgrowth of a course team-taught at Davidson College by a Biology professor (me) and an English professor (Ann Fox) on the science, art, and literature of HIV. Both English majors and Biology majors love exploring the topic from both disciplines. The greatest value an artist can give to a scientific conference will occur best if the artist discusses with the conference key speakers/organizing team is how to target carefully and translate the relevance of scientific topic to people’s everyday lives. The artist needs to keep their art performance/narrative short and to the point. Otherwise there will be cynicism in the audience. I have seen this at conferences on cycling infrastructure. that’s a surprising nice view. This is great. Of course as an artist myself I feel art could be relevant anywhere. This makes me also question how crossing “opposites” might play out in many different endeavors. This idea is really interesting. I never would have thought that there art can be very useful in a conference. Thanks for sharing this! Along similar lines, we had an improv workshop once at a Cold Spring Harbor meeting I went to. I think the predominant attitude at the beginning was ‘bemused’, but by the end it was ‘enthusiastic’. It wouldn’t be surprising if this idea will not work, I am not an artist, but i often go to conferences or seminars and one thing I noticed is that sometimes it gets boring. Somehow this becomes an ice breaker of some sort. I’ve always thought science and art should be brought closer together. artists & scientists together & inspiring each other….pretty powerful mix, full of potential. I would go as far as to say some of us scientists need to interact full stop. I know I should. Brilliant, I am an artist at the Commonwealth Scientific and Industrial Research Organisation (CSIRO) and found collaborating with scientists to be a great experience – a two way endeavour, especially sharing and exchanging of creative knowledge and ideas. Pingback: Chemie, Kunst, Chemie als Kunst?